The South Africa 2010 party got under way in style last night with a joyous, colourful and truly African FIFA World Cup™ Kick-off Celebration Concert in Soweto, Johannesburg. Held in the football heartland that is Orlando Stadium, home of iconic club side Orlando Pirates, the concert featured a host of stars including Shakira, Alicia Keys, K'Naan and the Black Eyed Peas. A wide variety of acts took to the stage but the abiding theme was one of celebration for the African continent with the event broadcast across the world. 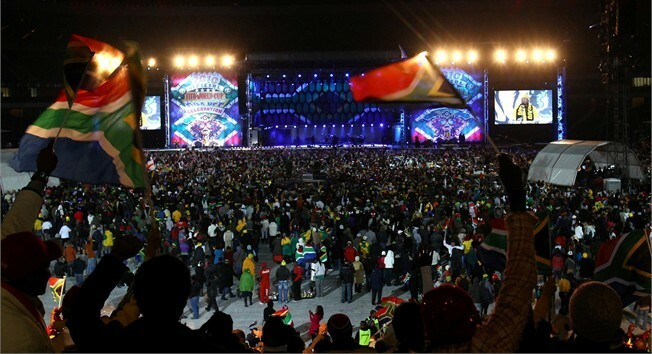 The countdown clock introducing the three-hour extravaganza finally hit zero and with it came a cacophonous roar as seemingly thousands of South Africa flags were lifted aloft creating an ocean of colour among the estimated 30,000 in attendance. Joining the countless Rainbow Nation colours were a broad cross-section of national flags representing every corner of the globe, as the many visitors in attendance took the opportunity to enjoy Africa’s impressive ability to turn on a party. FIFA President Joseph S. Blatter and South African President Jacob Zuma jointly opened the concert after the early acts. As the evening progressed a cavalcade of football stars took to the stage between performances including former Bafana Bafana captain Lucas Radebe, Christian Karembeu, Quinton Fortune, Socrates and Jay Jay Okacha. Another joyous presenter was Archbishop Desmond Tutu decked out in Bafana Bafana supporter gear and who introduced a video presentation on Nelson Mandela with trademark enthusiasm. The large crowd rarely dropped their energy levels and their infectious enthusiasm was palpable. "I have been to a lot of concerts but I have never been to a concert like this," said ebullient Johannesburg resident Khensami Majola, just as K'Naan took to the stage to perform his poignant song 'Wavin Flag'. "It is amazing fun, we are having a huge jam. It is a perfect presentation of Africa – north, south, east and west." The concert drew to a spectacular conclusion with Colombian pop princess Shakira in impressive form. She was joined on stage by Freshlyground for a rendition of 'Waka Waka (This Time for Africa)', the Official FIFA World Cup theme. Another proud concert-goer was Soweto local William Oosthuizen who spoke with pride as he took a rare break from dancing. "I am very proud and I am enjoying this immensely,” he said. “Beauty in the heart of Soweto. This is what Africa is all about. Sport has a unifying factor and it’s all about people enjoying themselves."